Home of the Wright brothers and long known as the Birthplace of Aviation, the Dayton region now enjoys a new accolade: In November 2004, Congress recognized the Dayton region as the National Aviation Heritage Area, in honor of the region’s leadership in our nation’s aviation history. Transportation between the start/finish area and runner drop-off area provided by RTA. Moving from vision to reality . . . that’s what the Dayton Region Entrepreneurial Signature Program is all about. 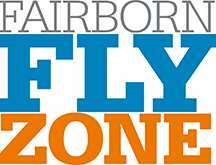 The Fairborn Fly Zone is THE place to watch full marathon runners in downtown Fairborn. Enjoy food, entertainment and cheer on the runners has they come through.